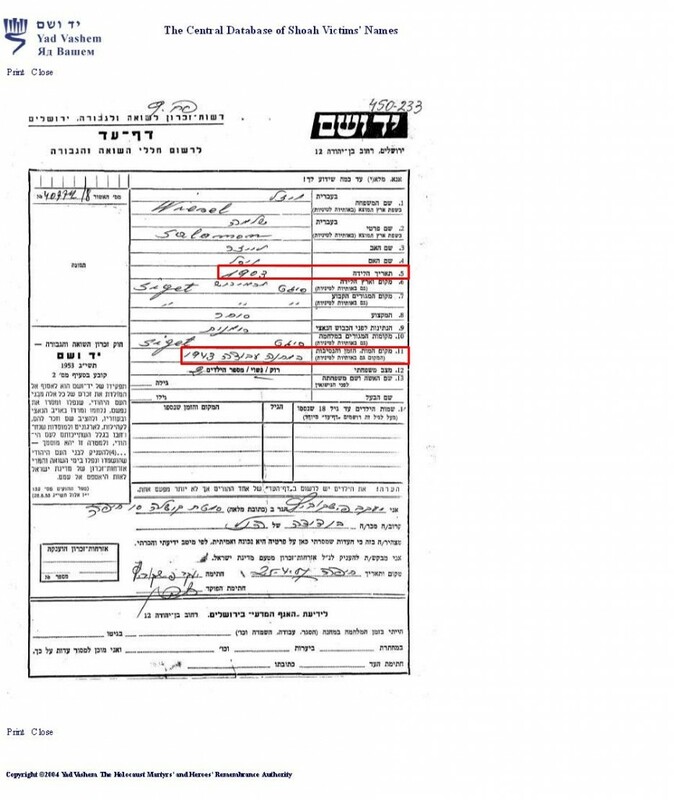 New Information – Shlomo Wiesel dies in labor camp in 1943? 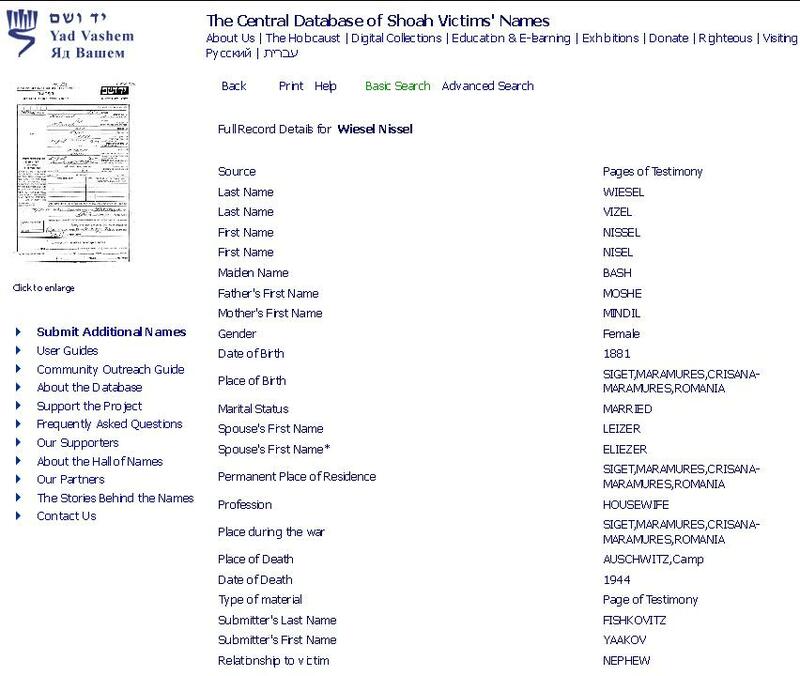 New information has come to the attention of this site about the Yad Vashem “Page of Testimony” (PoT) filled out for Shlomo and Mendel Wiesel by their cousin Yaakov Fishkowitz in 1957. Our previous description of these pages was done without knowledge of Hebrew; thus we erred in one instance dealing with the place of death of Shlomo and his brother Mendel Wiesel. Note on the forms above that “Sighet,” on line 10, refers to the “Place of residence during the war,” not to the place where death occurred. 11. Place of death, time and circumstances (Place also in Latin alphabet). This gives quite a different picture than we had before! According to Yaakov Fishkowitz, his cousins Shlomo and Mendel Wiesel were both in a camp performing labor in 1943, where they both died in that year. Fishkowitz obviously did not know what camp. Sighet was located right on the border with what had been Czechoslovakia, but was at that time more of Hungary until 1945. [See map in Shadowy Origins of Night II] Today, that area is Ukraine, and Sighet is once again in Romania. If the brothers had gone north on some kind of mission, toward Poland, they could have gotten arrested and placed in a camp as labor. But, in any event, Fishkowitz may not have had actual information that they died, only that they didn’t come back to Sighet and he didn’t see them again. The same goes for all the rest of his family—they were deported to Auschwitz, he says, and he never saw them again … so he declared them dead. But what about Yaakov Fishkowitz, himself? Was he also at Auschwitz? Why did he survive? What kind of credibility can we assign to Yaakov Fishkovitz? Fishkowitz filled out ten pages of testimony (PoT’s) on the same day, April 25, 1957, for ten relatives. Of the ten, only the two brothers were said to have died in 1943. All the others, including his aunt Nisel Wiesel, Shlomo and Mendel’s mother, he presented as perishing in 1944, all but one at Auschwitz. It doesn’t seem that he would have differentiated a totally different fate for Shlomo and Mendel if he didn’t have reason to think that it was different. According to Fishkowitz, seven members of the Basch and Fishkowitz family died at Auschwitz in 1944—two uncles and a cousin, Naftuli Basch, 39 yrs. ; Nisel Basch Wiesel his aunt, 64; his mother Mentza Basch Fishkowitz, 65; his father Fishel Fishkowitz, 66; his 29-year-old sister Shewa Fishkowitz Kohen. Yaakov’s 20-year-old brother Shlomo Fishkowitz died in 1944 “at labor” but Auschwitz is not mentioned. Could he have been one of the young men who were taken off to work on infrastructure construction for the Germans? Yaakov’s father was born in Strimtura, another town in the Maramures district. His mother was born in Sighet but lived in Strimtura after her marriage and their children were born there. In 1944, only his father, mother and younger brother Shlomo lived in Strimtura; the other seven relatives who “died” lived in Sighet, which was clearly the “big city” of the district. Was Yaakov living in Sighet at that time, too? When he filled out the PoT’s in 1957 he was in Haifa, Israel, which he listed as his permanent address. Did he leave for Israel immediately after the “liberation” and have difficulty tracking down his family members after that? According to Yaakov, not only the old, but the young and those in the prime of life were murdered! Why was the 14-year-old Elie Wiesel spared from “extermination” by claiming to be eighteen1, but his 20, 29 and 39-year-old relatives were not spared? And why would 20-year-old Shlomo Fishkowitz die from “labor” when 14-year-old Elie Wiesel did not? Wiesel’s two sisters, age approximately 19 and 22, were sent to a work camp affiliated with Dachau and survived. Shewa, Yaakov’s 29-year-old married sister, is said to have been a seamstress. Surely the SS could have found plenty of work for her to do, and no doubt did! At Auschwitz, there was a workshop full of sewing machines where female inmates constructed German military uniforms, along with whatever other sewing projects were carried out. Another legitimate question is why some of these relatives were not met by Shlomo and Elie early on during their stay at Auschwitz but relatives Asher Stein and Hersh Genud, plus hometown friend Meir Katz, are? When Elie Wiesel filled out a Page of Testimony for his father in 2004 at the Yad Vashem Memorial in Israel, at the request of Avner Shalev, Chairman of the Yad Vashem Directorate, it was filmed as a publicity tool to persuade more Jews to submit these PoT’s. (see film here). In the short film, Wiesel mentions briefly that his father had been arrested and detained for a spell. He said more about this in his memoir, All Rivers Run to the Sea, writing that his father was arrested for helping Polish refugees and “spent weeks in prison, first in Sighet, then in Debrecen,” and was released because of help from “his friends in Budapest.” Wiesel fails to give a date for this. It all takes place in Hungary, however, not in Poland. But Hilda Wiesel doesn’t mention it at all in her Survivors of the Shoah testimony. Was this what became a “camp” to Yaakov Fishkowitz? When he heard that Shlomo Wiesel was dead, did he put it together in his own mind later that his cousin died during that short imprisonment? But why include Mendel in the event; he was not included by Elie. If Yaakov Fishkowitz’ testimony is completely wrong, it means no PoT at Yad Vashem is worth the paper it’s written on. Even Elie Wiesel’s PoT for his father does not include a birth date, though a Yad Vashem representative was sitting right there with him (as seen in the film) and should have encouraged Wiesel to complete the form fully! I’m being a bit facetious here. Does not a son know his father’s date of birth? In Night, Elie wrote that Shlomo is 50 years old—in 1944. So why didn’t he use that on the PoT? Another point is: wouldn’t the Page of Testimony by Fishkowitz for Elie’s father have been shown to Elie Wiesel? Would they not have searched through the testimonies to find what had been submitted for Wiesel’s family? I’m sure they did. Both PoT’s cannot be correct! Yet they both remain in the database. This is a serious criticism of the integrity of the Yad Vashem Memorial and of the Elie Wiesel support team. As we know, a distinctive feature about the Elie Wiesel story is that there is no consistency to it and no one seems to want there to be any. Yaakov Fishkowitz was not writing these Pages of Testimony to fit in with a book written by Shlomo’s son. We don’t know his reasons for writing what he did, but he would not have been concerned with fitting in with any particular family story. He probably put down what he thought had happened to these persons, given the political atmosphere of the time, or what he wanted the world to believe about them. All I can say is: He did place Shlomo Wiesel and his brother in a labor camp in 1943, and said they had died there. If true, Elie Wiesel’s story is completely fabricated, or based on someone else’s story. More serious discrepancies will be brought forth in the next article. Stay tuned. 1. Elie Wiesel, Night, 1960, p. 41. “How old are you?” he asked, in an attempt at a paternal tone of voice. “Eighteen.” My voice was shaking. Why is Grandma Nisel not mentioned in Elie Wiesel’s Night? According to Hilda Wiesel’s 1995 “Survivors of the Shoah” testimony, Grandmother Nisel (also spelled Nissel) went with the family to Auschwitz. According to Elie Wiesel’s 1995 memoir, All Rivers Run to the Sea1, Grandmother Nisel went with the family to Auschwitz. Did Wiesel simply forget about his grandmother only 10 years after the event and then remember her again in the 1990’s? Did he cut her out because he wanted to condense his book and she was peripheral to the storyline? Neither of these can be believed. In the first place, Wiesel makes it clear in All Rivers how important Grandma Nisel was to him and he writes affectionately about her. Secondly, by including his grandmother when he mentioned his mother and three sisters, he would not have added more than a few words to the deportation narrative, as we will see. Thirdly, Grandma Nisel, as a member of his family group that he says he lost at Auschwitz, could not with any decency be left out when writing about this momentous event. And, in fact, he didn’t leave her out of his memoir, nor did Hilda leave her out of her testimony. But Night is another story (pun intended). Who is Grandmother Nisel and why is she important? Nisel Bash was the daughter of Moshe and Yehudit (or Mindil) Bash (or Basch). She was born in 1881 in Chust, Ruthenian-Czechoslovakia. She married Eliezer Vizel and lived with him in Sighet, Rumania … which later became Hungary. (This information is from the victim forms filled out for Yad Vashem by her nephew and grandson; see further below.) We don’t know the date of her marriage, but her first child may have been born in 1900 when she was 19 years old. This first child of Nisel and Eliezer was probably a daughter, either Idiss or Giza. 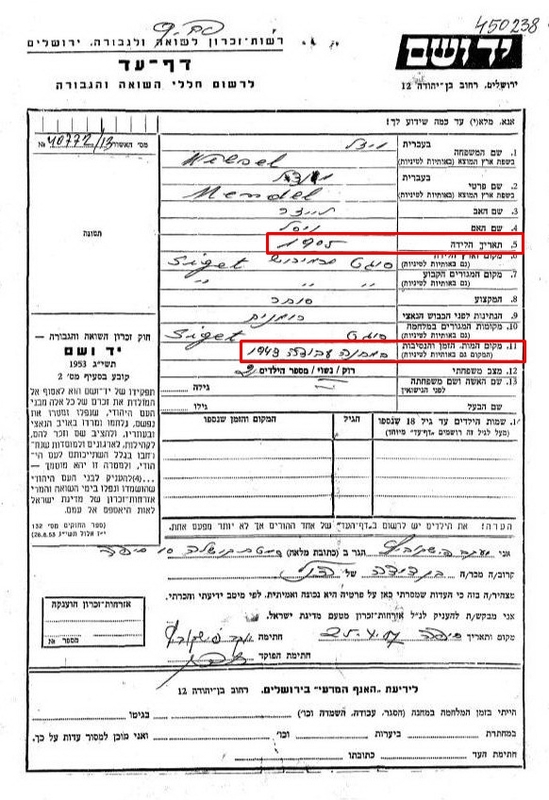 In 1903 their first son, named Shlomo, was born. After that came another son, Mendel; then two more daughters. 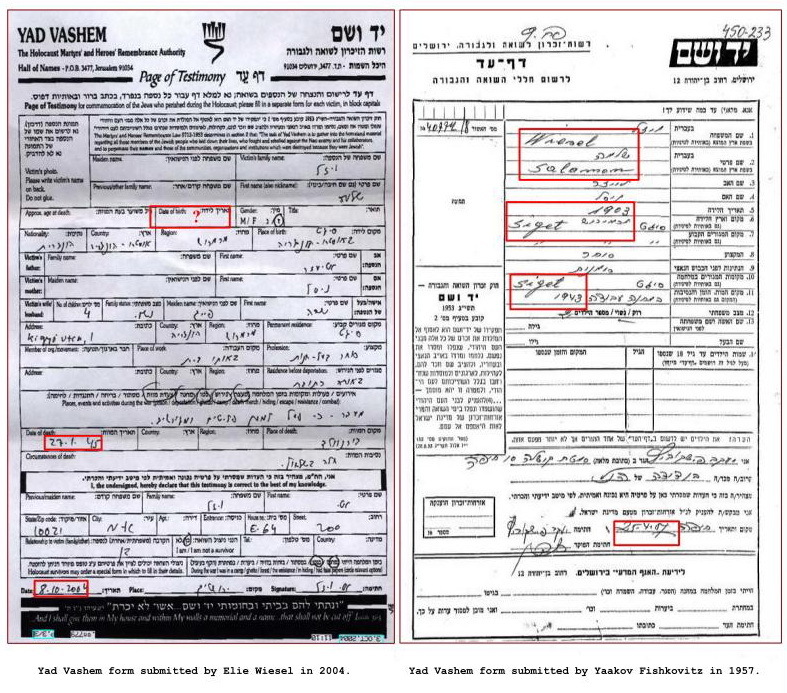 Below: YV forms for Shlomo Wiesel by Son Eli and cousin Yaakov Fishkovitz. (click on picture for larger image) Below that is the 1957 YV form for Mendel Wiesel by Yaakov Fishkovitz. From this we can understand that Shlomo was the oldest of the two sons. Among Orthodox Hasidic Jews, males are in an entirely different category of importance and expectations than females, who are only required to find a good husband and have children. Mendel married Golda Feig, the sister of Sarah Feig, making for a tight-knit Wiesel-Feig family relationship. Yet in 20 pages in the book Night of detailed description of the pre-deportation events, the trip to Auschwitz and their arrival, there is no mention at all of a grandmother. Nowhere in the entire book is there a Grandma Nisel. Other family members place Grandma Nisel at Auschwitz. Hilda also said: “And my mother – died. She was 44 years old.” She then repeated: “And my little sister – dead at age 10.” These are assumed deaths. But if she is correct about her mother’s age in 1944, then Sarah Feig was born in 1900. Could she have been 3 years older than her husband, born in 1903 according to his cousin Yaakov? Possibly, even considering what we know about Hasidic marriages, wherein the groom is usually no more than one year older, or the same age, as the bride.3 But Hilda, being the eldest, should know her mother’s age. 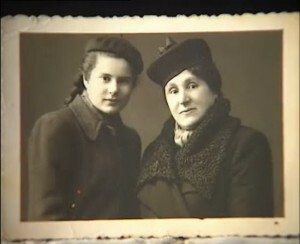 Right: Hilda, age 16, in 1938 with her mother Sarah Feig Wiesel, who would have been 38 in the picture if she were born in 1900. The name Shlomo appears only once in Night at the end. We had already been eight days at Auschwitz. It was during roll call. We were not expecting anything except the sound of the bell which would announce the end of roll call. I suddenly heard someone passing between the rows asking, “Which of you is Wiesel of Sighet? The man looking for us was a bespectacled little fellow with a wrinkled, wizened face. My father answered him. The little man looked at him for a long while, with his eyes narrowed. Let’s remember there were many Wiesel’s (Vizel’s) in Sighet, a town with a large Jewish population. 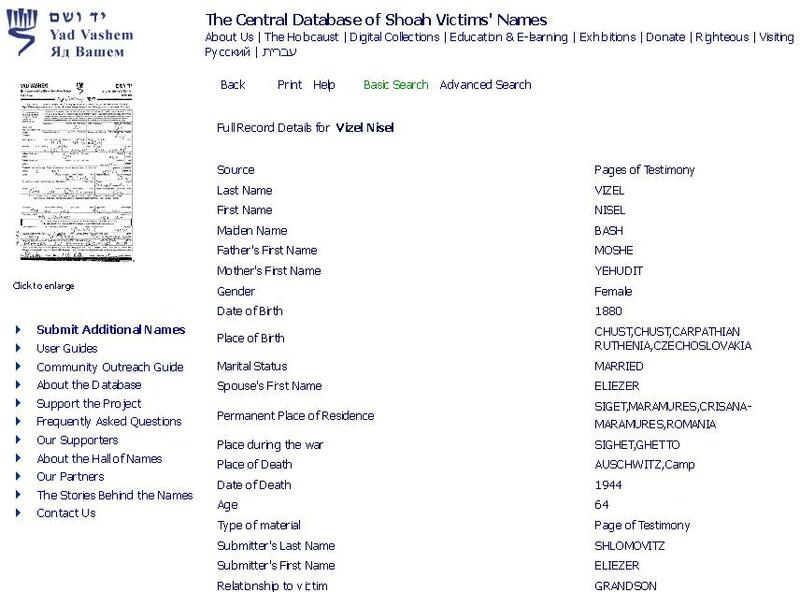 For example, there are three Mendel Wiesel’s from Sighet of around the same age in the Yad Vashem databank, and there are eight Shlomo Wiesel’s recorded as succumbing in the camps. This doesn’t include all the Wiesel’s with other first names! So we can expect that the man Stein would have used the first name too, or Wiesel would have asked Stein which Wiesel he was looking for. This seems like another avoidance of using the name Shlomo, but it is strange that both the first and last name were used one time only. There were four of us children: Hilda, the eldest; then Bea; I was the third, and the only son; the baby of the family was Tzipora. In the original Night (p 31), the family servant, a Christian from a nearby village, is named Martha. In All Rivers, she becomes Maria, and the name in the 2006 re-translation of Night is changed to Maria. Okay, it could have been an error. The dust jacket on an original, hard-bound copy of Night reads: “The adolescent Elisha and his family, among hundreds of thousands of Jews […] are cruelly deported …” Elisha is not the name of the main character in the book; it is Eliezer. The first time that name is used is on page 86: “Let’s hope that we shan’t regret it, Eliezer.” On page 92: “Don’t let yourself be overcome by sleep, Eliezer.” On page 96, Eliezer is addressed by his name twice by Juliek. On page 108: ”Eliezer … my son … bring me … a drop of coffee…” Then, again, on pages 109, 110 and 112. Why is he called Elisha on the dust jacket? Elisha is the name of the main character in Wiesel’s second novel, Dawn. A little mix-up there? In Night, Father is 50 and little sister is seven. 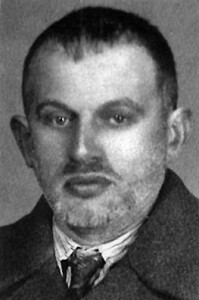 In spring 1944, just arriving at Auschwitz, Eliezer’s father declares that he is fifty years of age. Eliezer says he is “not quite 15.” (p 40) In the new 2006 translation (p 30), Eliezer’s age is changed to “15” but the father’s “fifty” remains the same. “Not quite 15” doesn’t equate to Elie Wiesel, whose birthday is Sept. 30, 1928, so that was an oversight in Night. Or it can also be seen as a similar situation as with Tzipora’s age: Making the young victims even younger so they will appear more sympathetic to the reader, and making some adults older. Lying about their age is a tactic used by many “holocaust survivors” in their memoirs to explain how they escaped the “gas chamber.” Arguably, this could have been done by Sarah Wiesel for Tzipora too—claiming her to be 14 instead of 10, since in the story Night, Eliezer made himself out to be 18 (3 years older that he really was) and got away with it. Why is the father in Night fifty? Shlomo Wiesel was certainly somewhere between 40 and 44 years of age in 1944. Actually, according to his cousin Yaakov, he wasn’t even alive, having died in 1943! Moreover, Mendel died in 1943 also. One has to assume from this that they died together somehow. Yaakov filled out a form for Mendel at the same time as for Shlomo. The forms look exactly alike except for the different name and date of birth. Shlomo is shown to be born in 1903, Mendel in 1905. Keep in mind that in 1957 the book Night was not yet published in French or English and the name of Elie Wiesel was completely unknown, so Fishkowitz had no reason to lie to protect his relatives, as he might have had later. Contrarily, on the Yad Vashem form Elie Wiesel filled out in 2004, no birth date is given for his father, nor the age at death. Did he not know? Is it possible for a son not to know his father’s age? This photograph (left) of Shlomo Wiesel was taken in 1942 according to Hilda Wiesel. At this time he would have been 39 years old. Further, we have no information on these details for Wiesel’s mother Sarah Feig either, and no family member (or anyone) ever filled out a YV Holocaust victim form for her or her youngest daughter who supposedly died with her at Auschwitz. (Can the reason be that they don’t want to record an age/birth date for either one?) But, as I wrote above, Hilda Wiesel Kudler said in her Shoah testimony that her mother was 44 years old when she died, and her youngest sister was ten. Is Hilda a reliable witness? On page 30 of Night, Eliezer says: “I looked at my little sister Tzipora, her fair hair well combed, a red coat over her arm, a little girl of seven.” This is when the family was walking to the ‘small ghetto’ after being ordered out of their home in the spring of 1944, only a week or so before they arrived in Auschwitz. But Hilda said Tzipora was then ten years old. Which is correct? Or is neither? Some of my readers will tell me, “What does it matter?” Accuracy matters, because if a source is wrong in some things that can be determined as wrong, nothing from there should be depended upon. Nowhere in All Rivers do we find Tzipora’s age given by Wiesel, even though he mentions her many times. He only wants us to know that she was young or “a child.” A ten-year-old girl is quite a bit more mature than a seven-year old. I venture to say she was given the age of seven in Night to make her appear more vulnerable, and her death even more of a barbaric crime. Also, if she were seven, there would be more reason to “exterminate” both mother and daughter, under the extermination thesis. But in truth, a 44-year-old-woman and her 10-year-old daughter could be quite useful in the labor force, and therefore could have gone on to meet some other fate. There may even be some private knowledge of that—which may be another reason no one has filled out a Yad Vashem Holocaust Victim report for these two, while two were filled out for 64- year-old Grandma Nisel. A fifteen-year-old with a gold crown? How many 15-year-olds do you know who have a crown on a tooth already? Thirty-one-year-olds may, the age Lazar Wiesel was in 1944. Or the following story could be totally fabricated. Wiesel writes in Night that when he was transferred to Monowitz (Buna), he was given a physical and a dental exam. The dentist wanted to remove his gold crown; Eliezer talked him out of it. One day his work foreman, named Franek, noticed the gold and told Eliezer he wanted it. Eliezer resisted, but eventually, after suffering a series of abuses, gave up his gold tooth to Franek. In this story, he is called out for his dental appointment by his number, “A-7713.” (p 58) The number is used again on page 64 when the Kapo decides to give him a beating. I felt the sweat run down my back. Yet where is the number A-7713 on Elie Wiesel’s left arm? At Buna, he worked in an electrical warehouse alongside some Polish civilians and a few French women After his beating by the Kapo, one of the French girls came over to him, “wiped his blood-stained forehead with her cool hand,” gave him a mournful smile and a bit of bread. Finally she spoke to him “in almost perfect German.” Several years later he recognized her in the Paris Metro, and prodded her memory. They went to a terrace café and she revealed to him that she was Jewish, from a religious family, and during the occupation she obtained forged papers and passed herself off as an Aryan. She was enlisted in “forced labor groups” and deported to Germany. That’s how she escaped the concentration camps. These kinds of stories abound in Night and other holocaust-survivor books. No witnesses, no proofs, no names, just a bit of imagination. I will remind you again that the original Night was published in 1960 categorized as Judaica/Literature … in other words, fiction. When the new translation came out in 2006, it was changed to Autobiography/Jewish Interest. It is now an autobiography of Elie Wiesel, with his picture on the back cover and a special new Preface, written by him, which condemns the Germans and attempts to explain the changes he and his wife have made in the text. 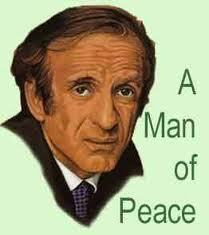 We make a leap of faith to believe that Eliezer Wiesel has to be Elie Wiesel. It should also be pointed out that these survivor stories were all the rage within the Yiddish-speaking communities at the time. There were many of them in circulation, even before they were published. Elie Wiesel had cousins in Argentina whom he visited while he was there in April-May 1954; he mentioned them in All Rivers.4 It’s very likely that he was introduced to these survivor stories, and Mark Turkov’s publishing house, through these relatives and their circle. Was he attracted to a particular story by an author with his own name, Eliezer Wiesel? Wiesel tells us another unlikely story in All Rivers (p 277) that in Dec. 1955, back in Paris, he received a copy of the published book, edited down to 245 pages, in the mail from Turkov. There are no witnesses to this. He only mentions telling one close friend, Israel Adler, who took him out for a coffee by way of celebration.(!) Shortly after that he moved to the United States. It appears from his writings that Wiesel forgot all about the manuscript he gave to Turkov until the book came to him in the mail, but he does add on that page that “they never did send back the manuscript”—to give himself a reason for not having it and not being able to say what was actually in it. In contradiction to this story is the one wherein Francois Mauriac, whom Wiesel first meets in Spring 1955, encourages him to write about his concentration camp experiences. He doesn’t tell Mauriac he has already done so, but acts like he will think about it, later accepting the guilt-ridden, elderly Catholic’s help in getting the book published. Wiesel writes in All Rivers, p 319, that he sent a manuscript of what became La Nuit (Night) to Mauriac one year later, in 1956. In 1957, during my convalescence, I received good news from Francois Mauriac: Jerome Lindon of Editions de Minuit was going to publish La Nuit (Night). The letter of confirmation opened a new chapter in the book of commentaries that is my life. Lindon didn’t like the orginal title: “And the World Remained Silent.” He preferred a biblical phrase, perhaps something from the Book of Jeremiah. But after discussing various suggestions, we settled on La Nuit. Lindon also wanted me to tighten the text, given to him by Mauriac, though I had already pruned and abridged it considerably. The text was given to the French publisher by Mauriac. In the following lines he says that he, Elie, was the one who made the drastic cuts in the original manuscript. When?! He proposed new cuts throughout, leading to significant differences in length among the successive versions. I had cut down the original manuscript from 862 pages to the 245 of the published Yiddish edition. Lindon edited La Nuit down to 178. What a tissue of lies. Never before had Wiesel written about the Yiddish book, but now, in 1995, he relates that it was he who cut the 862 pages to 245. Such a prodigious task would certainly not have gone unremarked upon by him! And now it is the publisher Lindon who did the final editing to 178 pages. One wonders just what part Elie Wiesel played in this group effort? Wiesel continues with an unconvincing “explanation” of why the book’s original ending was cut out, something that was made controversial by a certain Jewish scholar. He then says, “By the time Night was published in France, I was at work on another book.” This rendition of how such an important book came about is so sloppy and insulting to the intelligence of his readers that it speaks for itself. Both the USHMM and Wikipedia have the dates wrong. During an interview with the distinguished French writer, Francois Mauriac, Elie is persuaded to write about his experiences in the death camps. Elie Wiesel finishes a nearly 900-page manuscript in Yiddish while on assignment in Brazil. And the World Stayed Silent is published in Buenos Aires, Argentina. Elie Wiesel becomes an American citizen. Wikipedia skips over the dates, doesn’t give any dates for the writing of the books because they don’t fit, but says that Wiesel moved to NYC in 1955. Others say he moved to NYC in 1956. Since he was still in Paris in Dec.’55, one assumes he didn’t leave for the U.S. until Jan. ‘56. Wiesel nowhere gives a date, which is the reason for the confusion — his biographers have to guess. But, while he received a U.S. “green card” sometime after recovering from his accident, he did not become a citizen until 1963. Wikipedia is known to change its information on Wiesel without notice. For example, it now spells his father’s name Chlomo, whereas previously it was Shlomo. Why did Wiesel start campaigning for the Nobel Prize the same year Mark Turkov died? This could account for why Elie Wiesel suddenly began to speak and write about ‘his’ Yiddish book, published in Buenos Aires, Argentina in 1956. He deals with it in his memoir All Rivers, published in 1995, after Turkov and everyone else associated with it are dead. No witnesses. Is it too far-fetched to believe that Turkov agreed to remain silent about the real author of Un di Velt Hot Gesvign, either by being bought off, threatened, or even voluntarily? And once Turkov was safely dead, Wiesel and his supporters could breathe more easily about claiming his authorship of the book. It is a strange fact that the title Un di Velt Hot Gesvign (or, in English, And the World Remained Silent) does not appear on the long list of “books by Elie Wiesel” at the beginning of his memoir All Rivers, nor in the original or in the new 2006 translation of Night. It also does not appear in the complete list of his books at The Elie Wiesel Foundation for Humanity. It is, however, at the beginning of the list of his books on Wikipedia. Clearly, there is uncertainty about this book, perhaps a desire by publishers not to put down in writing something that could bring them a lawsuit … or perhaps a wish by Wiesel not to stimulate questions about that book. 1. The characters in Night are only loosely based on Elie Wiesel and his family. Therefore it can’t be called an autobiography. 2. Elie Wiesel is the author of Night, written in French with the assistance of his editor and probably Francois Mauriac, but he is probably not the author of Un di Velt Hot Gesvign. 4. In the winter and spring of 1956, in the United States, Elie adapted the book to a shorter version in French, which he mailed to Francois Mauriac in Paris. He inserted the names of his family members and personalized it, especially in the beginning chapters. 5. The secrecy of the birth and death dates among Wiesel’s close relatives is to keep from contradicting what is written in Night, on which his fame and fortune truly rests. Without Night, Wiesel fades into just another Jewish-Zionist writer. 6. Elie Wiesel’s failure to correct and clarify details of his family history (especially birth and death dates of his parents, sisters and other close relatives), and of the writing and publication of Un di Velt and La Nuit, mirrors his refusal to show the number A-7713 that he says is tattooed on his left arm. 7. The essential purpose for securing a Nobel Prize for Wiesel, in literature or peace, was to solidify his reputation in light of the fragility of Night as the basis of that reputation. Nobel prize recipients are a protected species by the entire “global elite,” not just the Jews. Having himself falsely identified in the Buchenwald Liberation photo served the same purpose. My challenge: I welcome any native Polish Yiddish speaker/reader who is also fluent in English to prove me wrong about what I have written above by providing an honest, accurate translation of Un di Velt Hot Gesvign into English so it can be compared with Night. Why hasn’t this already been done? It’s natural to be suspicious of what is kept hidden. Let’s put everything on the table so that the questions I have raised can be cleared up. 1. Elie Wiesel, Memoirs: All Rivers Run to the Sea, Alfred A. Knopf, New York, 1995. 418 pp.